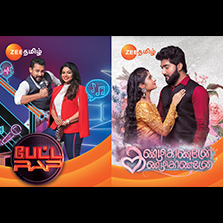 Zee Tamil's Prime Time Fiction Show Opens with a Bang! Kandukonden Kandukonden, Prime Time Fiction show opens with 4.37 TVR (Source: BARC DATA, Week 14), making it the highest ever fiction show opening for Zee Tamil. Last week, Petta Rap, a Sunday Afternoon musical game show opened with 4.22 TVR (Source: BARC DATA, Week 13). Weaved along the complexities of tradition and astrology, the story of Kandukonden Kandukonden encompasses the journey of love of a young couple who are brought together by the forces of fate and destiny. Yesteryear heroine Seema, Vishnu Unnikrishnan, Krishnapriya form the star cast of Kandukonden Kandukonden. Petta Rap is a fun-filled musical game show with unique rounds, that brings together leading stars from the Tamil Entertainment Industry in a never-seen-before avatar. Deepak and Maheshwari are the anchors of the show.